Arsenal fans may have thought they had seen the last of Thierry Henry in the club’s colours, but Arsene Wenger is seriously considering whether to bring back the legendary striker on a short-term loan deal. 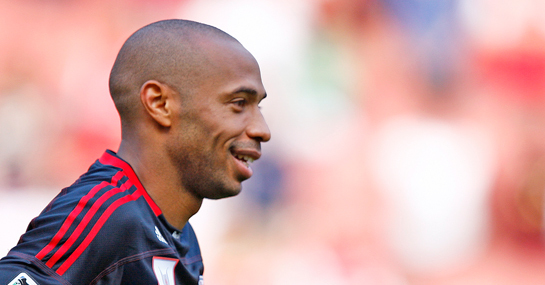 Henry sealed his place in Arsenal folklore by helping the club to two Premier League titles and three FA Cups between 1999 and 2007 and in the process netted 226 goals, which is a club record. Meanwhile, he made such an impact that a statue was recently unveiled outside the Emirates Stadium to honour his contribution. However, Henry may be once again seen in the flesh should Wenger decide to re-sign the Frenchman on a two-month deal to cover for the absences of Gervinho and Marouane Chamakh at the African Cup of Nations. The duo will head off for the tournament in mid-January and could be gone for as long as a month. With Henry already training with the club and not expected to return to the New York Red Bulls until March, the timing is almost perfect that he could provide the spark around Arsenal to aid them in their quest to finish in the top four this season. If Henry does sign there is even the possibility that he could feature in a major showdown with Manchester United at the Emirates, which is set to take place on January 22nd. Arsenal’s odds are currently a relatively large 6/5 to finish in the top four, despite the fact that they are only one point off fourth and still have to play all of the clubs above them at home.